I'm fabricating the fuel filler & foot valve assembly for my model Fairbanks-Morse engine. It's comprised of three pieces of 1/8" brass pipe. Two of the pieces are cut with a saddle joint, to be soft-soldered to the third piece. My soldering skills are OK, but not great. I would like this to look nice when the job is finished. So, my question is, is there something that can be applied to the pipes to prevent solder from sticking in areas where I don't want it to? I've been told that graphite (like a pencil) will work, but the pipe is shiny and slippery and I'm not sure the graphite will adhere well enough to do the job. Yes, I agree, silver solder; I think that with vibration, soft solder would fail. If you have tig silicon bronze would be another choice. I suggest getting some silver solder and some silver solder flux and practice and you will find it valuable for many dissimilar metals that need to be brazed together. Using regular tin/lead solder would work ok, the devil is in the execution. Both joints would need to be done simultaneously. I would fasten the main piece in a vise, then use baling wire to hold the other two pieces on so they won't slip. Flux the joints with liquid or paste flux, then heat with a propane torch and touch the solder to the part- as soon as it begins to flow, stop heating. It will only take a tiny bit of solder, surprisingly little. You'll see it run around by capillary action almost at once. Use silver solder paste. Put in on carefully, wipe away where not wanted. Then you go no huge blobs of silver solder to mar up the appearance. 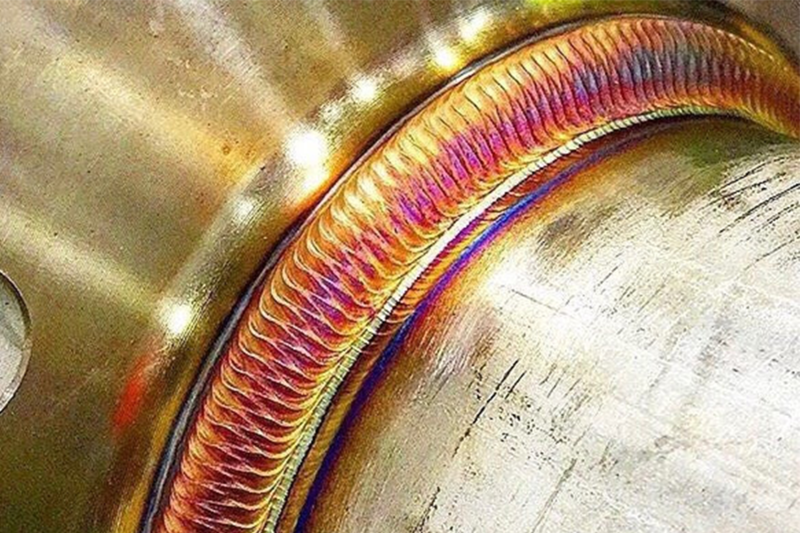 GTAW works well on copper and the weld will essentially be the same color as the base metal, send it to a welding shop if you do not have the equipment. If done well it will look like this. Theres a chalk-like material, (soldering talc) that’s supposed to prevent the solder from attaching to the work. Comes in sticks that you then wipe over the work where you don’t want the solder to stick. Of course, careful application of flux and solder could achieve the same result. Not addressing the issue of whether a stronger material is required for your application. Zinc chloride is a liquid flux that attacks the heated metal oxides to enable solder to stick and clow into the joint(s). Haven't tried it but have heard White Out for a type writer works, if its still available. solder-charged iron against the surfaces for a few seconds, and the tinning is done. Then, wash off all the flux. can cold-form a solderable additive element (like the lugs on a brazed bicycle frame). Hard solder (silver solder) is not easy with brass, because the melting points are too similar. I'd try to avoid that. Soot deposits from an acetylene-rich torch flame will reduce adherence of silver solder. Apply the soot, wipe the soot away where you want the solder to stick with some alcohol and solder. John do a search for liquid solder mask. There all sorts of options, typically used in the printed circuit industry. I tried an experiment using both graphite (soft lead pencils) and liquid paper (typewriter correction fluid) on an extra piece of brass pipe. Both seemed to inhibit the solder flow, but the graphite is tricky because it comes off easily as the part is handled. My Dad used to say, "God hates a coward", so I decided to proceed using the liquid paper. It took a couple of tries, but I got the job done and it doesn't look too bad. The first picture shows the piece immediately after soldering, still in the "quick & dirty" fixture I made to hold the parts. It looks messy because it still has the liquid paper and some excess solder. The second picture shows the assembly after some cleanup, attached to the gas tank and filled with water for a leak test. It passed! It just needs a little more cleanup now. thanks for showing your results. I will add that trick to my list.